Notes: Front Bucket Seats with Solid Rear Back Rest. For Models that had Plastic Seat Back (Plastic Seat Backs are Not Included). Includes Hog Rings, Hog Ring Pliers and Instructions. The back of the rear seat is made of black carpet to match the cargo area. This is replacement seat upholstery; not slip on seat covers. This Pontiac Firebird Front Bucket Seats with Solid Rear Back Rest Upholstery set is a high quality product following the factory sewing pattern and factory attachment points. For Models that had Plastic Seat Back (Plastic Seat Backs are Not Included). Made in the Material of your choice. Includes instructions, hog rings and hog ring pliers. Requires physical seat be removed from vehicle, old upholstery removed and new upholstery installed. 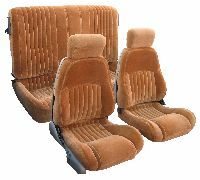 This is replacement seat upholstery; not slip on seat covers.